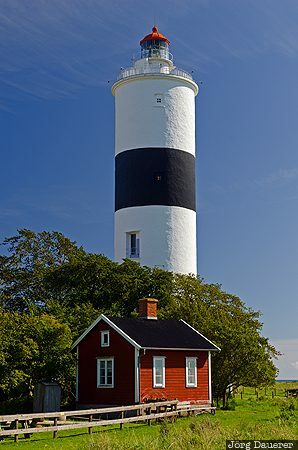 The lighthouse Långe Jan at the southern tip of the island Öland in the Baltic Sea behind a red wooden shack below a blue sky. Öland is in the province Kalmar, Sweden. This photo was taken at noon on a sunny day in September of 2014. This photo is part of the exhibition Lighthouses of Northern Europe (Oct'15). This photo was taken with a digital camera.